During a war which saw the aircraft carrier assume at least equal importance with the battleship in fleet operation, the air station took its place with the navy yard, the training center, and other important shore units as an indispensable and major element of the Navy. From a 1939 system of eleven inadequate air stations and eight reserve air bases, the Navy's aircraft ground facilities grew to comprise almost 80 air stations and a host of satellite fields. At each of 38 air stations, more than $10,000,000 was spent for construction during the National Defense and the War periods. Although the air stations had many missions to perform, and many facilities, such as hangars, seaplane ramps, and barracks, to aid in the performance of their missions, they had one basic assignment: To keep aircraft flying -- aircraft, the most dependent of all Navy's craft, self-sustaining only during flight. All maintenance, from minor corrections for wear to major overhaul, had to be performed on the ground, most of it by non-flying personnel. Ground crews as well as flight crews had to be housed and subsisted on the ground. Providing these ground facilities, except machinery and other collateral equipment, was the job of the Bureau of Yards and Docks. A few years before World War I, it was necessary to build ground installations for only a handful of aircraft at one station. In the years between wars, however, aviation facilities had been steadily expanded, and the Bureau's assignment in World War II was to build a system of air bases which would support 27,600 airplanes and 200 lighter-than-air craft. The first naval air station was established in 1914 at Pensacola, Fla., at a site which had been a naval reservation since 1826. When the United States entered World War I. Pensacola had three steel seaplane hangars, a brick hangar, and a barge-mounted airship shed. In addition, Norfolk and San Diego were important air stations of World War I. The Navy also set up seaplane patrol bases at seven points along the Atlantic coast, including Cape May, N.J., and Key West, Fla., and at one point, San Diego, on the Pacific Coast. After the war, Pensacola and San Diego were maintained as permanent aviation training stations, and the establishments at Norfolk, Anacostia, and Quantico were progressively expanded in the years previous to World War II. Two developments somewhat bolstered naval aviation in the 1930's. Eight naval reserve air bases were set up at points throughout the United States, and three air stations were built on the West Coast to accompany the transfer of the Fleet's main strength to the Pacific. The reserve air bases, at which candidates for the navy's growing reserve of pilots were given primary flight training, generally were located at municipal or commercial airports. Their facilities were the barest, designed merely to house and maintain primary training aircraft and, in some instances, to house personnel. They were at Squantum, Mass., New York, N.Y., Miami, Fla., Grosse Ile, Mich., Glenview, Ill., Minneapolis, Minn., St. Louis, Mo., and Oakland, Calif. Each became a naval air station during World War II. The three West Coast air stations were at Seattle, Wash., Alameda, Calif., and San Pedro, Calif. Lakehurst, N.J., and Moffett Field, Calif., a station which was planned and built as an entity, were established between wars to serve as lighter-than-air stations. Parris Island was reestablished for Marine Corps flying. original facilities was begun July 8, 1931, and the original station was commissioned April 12, 1933. 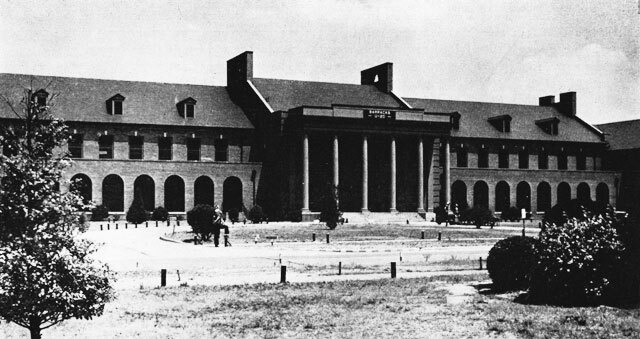 In October 1935, the station was transferred to the Army. On April 16, 1942, the Navy resumed control and the field was recommissioned as a naval air station. As developed in the years from 1914 to 1945, naval aviation was divided into three main elements: Navy heavier-than-air, Marine Corps heavier-than-air, and Navy lighter-than-air. 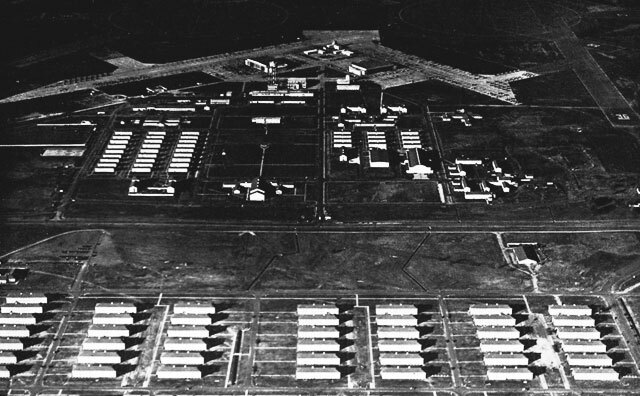 World War II ground facilities developed for Marine Corps air stations and lighter-than-air stations are treated in separate sections of the chapter. Navy heavier-than-air was divided into seaplanes and landplanes. Landplane operations were conducted with large aircraft for patrol or transport and small aircraft for carrier-based patrol or attack. The principal ground facilities of the pre-National Defense air stations were seaplane ramps, seaplane parking areas, seaplane hangars, landplane hangars, landplane runways, shops, schools, and personnel buildings. Site criteria were based on the necessity for providing a limited amount of landplane facilities alongside a protected body of water where seaplanes could alight and take off under a reasonable maximum variety of weather conditions. Almost all training for carrier-based airplanes was conducted ashore. Heavier landplanes were used in patrol operations alongside seaplanes. The Navy established an air transport system which used landplanes as well as seaplanes for long overwater hauls. The availability of water for seaplane landing facilities no longer was the important consideration in the selection of a site for a naval air station. A great system of inland air stations, most of them built for training air and ground personnel, sprang up, and even the great coastal stations had many satellites built for landplane operation only. Criteria for waterside stations remained essentially the same throughout the period from 1940 to 1945, although the development and use of faster and larger landplanes necessitated longer, more stable runways. bases, which themselves had grown beyond recognition during the war years. Intermediate training centers, like those at Pensacola and Corpus Christi, had not only grown to large dimensions, but they now had numerous auxiliary fields, each of which would have been called an air station if it had been built outside the cognizance of its mother station. In 1938, the Navy had only 1,000 planes. The so-called Vinson Navy Bill, which Congress passed in May 1938, authorized the procurement of enough planes to bring the number up to 3,000. On the same day that the Germans occupied Paris, in June 1940, the authorized strength was increased to 10,000 planes. The number was jumped to 15,000 the following month, with the passage of the two-ocean Navy bill. Early in 1942, the authorized number reached its final figure, 27,500. To create and maintain full aircraft strength, of the Navy procured 67,000 airplanes during the period of National Defense and War. The excess of the number procured over the number required at any one time was due to the need for replacing planes destroyed in battle, lost in accidents, or worn out. The Hepburn Board, in its report, dated December 1, 1938, stated that the need for additional shore facilities for aircraft far overshadowed that for other craft. The need had not arisen solely by reason of the large increase of strength authorized by the Vinson Bill; the shore establishment had failed to keep pace with earlier authorizations. The Hepburn Board report classified air stations as major air bases and secondary air bases. The major air bases were those which had facilities for major overhaul of aircraft. They were to perform the major overhaul not only for their own airplanes, but also for those of the secondary air bases. The report stated that the criterion of continental major base location should be strategic position for the defense of a large section of America's coast line. The board recommended one new site on the West Coast, Tongue Point, Oreg., and sites at Quonset Point, R.I., and Jacksonville, Fla., for new major bases to serve the East Coast, where Norfolk was the only major base. Banana River, Fla., was to be a secondary base. On the Gulf Coast, the major base was Pensacola, where all Navy advanced training was conducted. The board recommended the establishment of a similar station at Corpus Christi, Texas. Requirements for each of the major bases were expressed in terms of the numbers of carrier groups and patrol squadrons to be accommodated. In some instances, other facilities, such as carrier piers, were recommended. Because the number of planes recommended for the major bases would create an unsupportable traffic problem at a single field, the Hepburn Board urged the use of outlying fields. Some use of this type of facility was being already made, generally on unimproved leased property. The board recommended outright acquisition of outlying fields. The report also mentioned separation of seaplane from landplane facilities but did not support such a move at that time because of the duplication of administrative functions which would arise. The Hepburn base program was authorized by Congress and signed by the President on April 25, 1939. A month later, the 1940 appropriate act, covering authorization of the Hepburn bases, was signed. The act appropriated $5,850,000 for expansion at Pensacola; $17,000,000 for Jacksonville and Banana River; $500,000 for land acquisition at Norfolk; $1,000,000 for land acquisition at Quonset Point; $1,500,000 for Tongue Point; and $2,000,000 for expansion of the naval aircraft factory at Philadelphia. The Navy was also authorized to accept free land at Corpus Christi, from the state of Texas, and at Quonset Point, from the state of Rhode Island. Pensacola. -- The Hepburn report assigned to Pensacola an increase in pilot training facilities amounting to 50 percent. The board had weighed the alternatives of the expansion of Pensacola and the construction of an additional training station, and had decided that the need for facilities was so urgent that the Navy could not wait for the development of a new station. By acquisition of additional acreage, Pensacola's facilities could be expanded 50 percent, which would be sufficient for the purposes of the 3,000-plane program. However, as a hedge against a further expansion of authorized airplane strength, which would leave the Navy without adequate training capacity, the board recommended the construction at Corpus Christi of a training station with capacity equal to that proposed for Pensacola. for a landplane hangar at Pensacola. Other 1939 construction at Pensacola included an aircraft storehouse, three landplane hangars, a seaplane hangar, runways, and personnel facilities. This was the beginning of a program which by the end of the war provided Pensacola with 11 hangars and personnel facilities for 15,000. Jacksonville-Banana River. -- The Jacksonville requirements visualized by the Hepburn Board were: facilities for two carrier groups (planned with a view to expansion for four carrier groups); facilities for three patrol squadrons (planned for expansion to six squadrons); facilities for two utility squadrons; facilities for complete plane and engine overhaul; berthing for carriers at the inner end of the ocean jetty entrance to the St. Johns River; a channel to permit tender berthing at piers at the air station; and development of an outlying patrol plane operating area in the lower Banana River. Both operating and strategic considerations pointed to the east coast of Florida as the best location for a southeastern major air base. After exhaustive study, including tests of the area by actual operation of planes, the board recommended a site, known as Camp Foster, on the left bank of the St. Johns River, about 5 miles south of Jacksonville. The land was part government-owned, part state-owned. could be dredged so that tenders could navigate to Camp Foster, a distance of about 20 miles. The seaplane area was not ideal for full-load take-off in an east-west direction, nor for approach in times of low visibility, so an outlying seaplane facility at the mouth of Banana River, approximately 100 miles down the coast, was recommended. Dredging and filling at the Jacksonville site was begun in September 1939. By the end of 1939, work had progressed sufficiently to allow the award of a contract to procure steel for two hangars. Work was also begun on a pier and bulkhead. In December, the work of dredging and drilling at Banana River was put under contract. Almost all work initiated in the first five months of 1940 was performed at Jacksonville. Three storehouses were begun in January. In March, a small amount of gasoline storage was ordered, and erection work began on two steel hangars. Work started in May included the first barracks project and steel procurement for the assembly and repair shop. At the major bases, assembly and repair shops were built to contain the major overhaul operations specified by the Hepburn Board. By mid-1945, there were personnel facilities for 32,000 at Jacksonville. In mid-1940, Congress authorized the increase of the naval air strength to 10,000 planes, as anticipated by the Hepburn Board. As soon as this bill was passed, and in fact before it was actually signed by the President, the first construction project at Corpus Christi was initiated. On June 11, the same day that cost-plus-a-fixed-fee construction contracts were authorized for use within the United States, initial development at Corpus Christi began, under a CPFF contract. The station's original mission was primary flight training for naval reserve aviation pilots. Under Hepburn Board recommendations, the station was to be of a size comparable to the enlarged Pensacola. In the selection of this second training station, the board had considered all possible sites on the continental seaboard. Because the Gulf Coast afforded nearly ideal training weather and because a training station on the Gulf could readily be coordinated with Pensacola, choice was narrowed to that area. Corpus Christi Bay and its adjacent lands afforded suitable seaplane and landplane areas. The area was close to the half-way line between the Atlantic and the Pacific coasts, and it was in an area where there was little existing air traffic. Initial work at Corpus Christi consisted of 3 seaplane hangars; a reinforced-concrete assembly and repair shop, 610 by 400 feet; a three-story fireproof general warehouse; and aviation storehouse; 18 H-type barracks; 10 two-story wood-frame E-type general-utility buildings; and necessary utilities. The hangars and the aviation storehouse were of permanent steel-frame construction. By August 1945, Corpus Christi could accommodate 23,000 officers and men and more than 400 airplanes. Jacksonville, Lee Field. -- In June, Jacksonville's first auxiliary facility, Lee Field, was placed under contract. Work at Lee Field included a landplane hangar and runway. Eventually, Lee Field facilities accommodated 4,500 officers and men. Miami. -- NAS Miami began its naval career as a blimp station having a rigid mooring mast; it was developed as a naval reserve air base in the period between wars; and finally became a naval air station. During the war, the Navy also took over two commercial airfields which were operated as part of NAS Miami. The first contract for work at Miami included barracks, hangars, storehouses, a dispensary, and runway and taxiway construction. As completed in 1945, Miami main station comprised two fields with four runways each, quarters for 10,500 personnel, an assembly and repair shop, and three hangars. Norfolk. -- The first construction at Norfolk under the World War II program consisted of three 4,000-foot concrete runways, three steel landplane hangars, two steel seaplane hangars, three seaplane ramps, combination barracks and messing facilities for 1,288 men, an operations building, a dispensary, aviation storage facilities, aviation gasoline facilities, and extensions to existing shops. Under the Hepburn Board requirements, Norfolk was to have facilities for two carrier groups, with room for expansion to four groups; facilities for four patrol plane squadrons, with room for expansion to six; facilities for two utility squadrons; facilities for complete engine and plane overhaul. By August 1945, facilities included quarters for 29,000 personnel, nine hangars, and storage for 3,430,000 gallons of gasoline. This 362-by-201-foot brick and concrete building was erected in 1943.
acquired for the station. The board had recommended facilities at Quonset Point for two carrier groups; facilities for two patrol-plane squadrons, with room for expansion to four; facilities for complete plane and engine overhaul; a channel to permit carrier berthing at the station. The board had found few available air-station sites in the Northeast, but Quonset Point, on the western shore of Narragansett Bay, could be improved to adequate size for airfield construction by dredging and filling. The first Quonset Point contract included 20,000,000 cubic yards of dredging, 12,500 feet of steel bulkhead, 80-by-1,170-foot carrier pier, four landplane hangars, two seaplane hangars, concrete runways, barracks for 1,680 men, an assembly and repair shop, a 3-story general storehouse, an aircraft storehouse, and storage for a million gallons of gasoline. The quarters capacity eventually became 15,000. Almost 3,000,000 gallons of fuel storage was provided. Alameda. -- The Hepburn Board had recommended that Alameda be provided with facilities for two carrier groups, with room for expansion to accommodate four; facilities for five patrol plane squadrons; facilities for two utility squadrons; facilities for complete plane and engine overhaul. In July 1940, a CPFF contract was let to augment existing facilities there. Work comprised erecting two seaplane hangars, 242 by 320 feet; building seaplane ramps and parking areas; building an all-concrete carrier pier; grading and surfacing runways; extending the assembly and repair shop; extending the barracks to accommodate 1,140 more men. Barracks capacity in 1945 was 29,000; officers quarters accommodated 3,600. San Diego. -- The San Diego assignment under Hepburn Board findings was to provide facilities for four carrier groups; facilities for one Marine force group; facilities for five patrol plane squadrons; facilities for two utility squadrons; facilities for complete engine and plane overhaul. The board considered San Diego the best equipped of all major air bases. Nevertheless, it stated that San Diego was greatly deficient in seaplane hangars. landplane hangar. All this construction was of permanent type. Seattle. -- The third of the existing major air bases on the Pacific Coast was San Point, Seattle, on the west shore of Lake Washington. For that station the Hepburn Board recommended facilities for one carrier group, facilities for three patrol plane squadrons, with room for expansion to accommodate six; facilities for complete plane and engine overhaul; additional service for Alaskan squadrons. The board noted that the station was in process of expansion but that many items remained to be done to make Seattle a major base. Work at that station, beginning in July, included additional gasoline storage, barracks, storehouses, and an assembly and repair shop. Final personnel capacity was 8,500. Tongue Point. -- Work at Tongue Point, the site of a Coast Guard station, near the mouth of the Columbia River, got under way in July 1940, with the award of a contract for a seaplane hangar and extension of a storehouse. Naval Reserve Air Bases. -- In the fall of 1940, the Navy began improving its primary flight training facilities by building up its system of naval reserve air bases. At Squantum, existing runways were improved, and dredging for seaplane approaches and an 18-foot ship channel was begun. Construction was initiated on three new reserve air bases at Dallas, Texas, New Orleans, La., and Atlanta, Ga. Facilities at the three new stations, which were identical, included a steel hangar, barracks for 100 cadets, a small assembly and repair shop, and gasoline storage for 50,000 gallons. In 1945, the three stations had personnel accommodations for 3,000 and 1,700 and 3,400 respectively. By the early part of 1941, the Navy had crystallized plans for the disposition of the 15,000 planes which had been authorized during the previous summer. In general, Hepburn bases were to be expanded to the full extent foreseen by the board. Further operational expansion was to take place at Squantum, New York, Quantico, and Neuse River, N.C. (for Marine Corps aviation), Key West, Fla., Puget Sound (site to be selected), and San Pedro. Further development of Pensacola and Corpus Christi to provide for 300 primary entrants a month at each was planned. Training facilities for 200 primary entrants a month, plus advanced patrol plane training, were planned for Jacksonville, and facilities for carrier training of allocated graduates of Pensacola and Jacksonville were planned for Miami. Plans also included a new flight-test center at a site to be determined. Flight-test activities at that time were conducted at Anacostia. Pensacola, Ellyson Field. -- In early 1941, Pensacola had two outlying fields -- Corry, almost ten years old, and Saufley, a recent acquisition, 10 miles northwest of the main station. A contract let in February started work on another site, Ellyson Field, 13 miles northeast. Barracks for 400 men, two brick and steel hangars, 110 by 175 feet, storage for 115,000 gallons of fuel, and runways were the main features of the project. 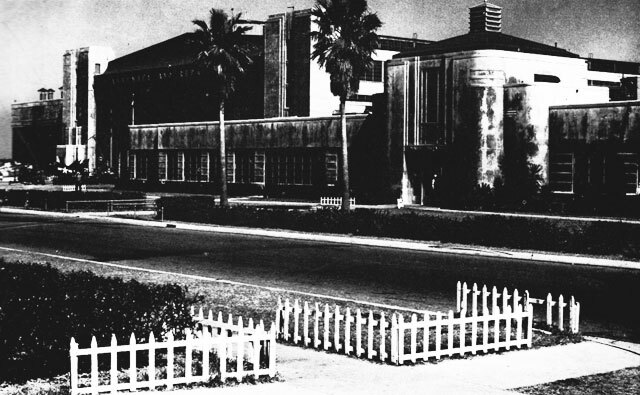 Barracks capacity at Ellyson in 1945 was 2,900. Anacostia. -- War work at Anacostia Naval Air Station began in May 1941 with the award of a contract for barracks extension, a landplane hangar, and other facilities. Later construction increased the personnel capacity to 2,300. St. Louis. -- At St. Louis a steel hangar and an assembly and repair shop were started. A series of additions brought the barracks capacity to 3,700 at the time of the Japanese surrender. Key West. -- Plans for the 15,000-plane program had earmarked facilities for the operation and maintenance of two patrol plane squadrons at Key West. In June, a contract for seaplane ramps and parking, as well as for barracks for 440 officers and men, was let. Minor repair facilities were built during the war, and barracks and quarters for 4,700 were provided. Jacksonville, Cecil Field. -- In July, work began at a new Jacksonville auxiliary, Cecil Field, planned for installations equal to those at Lee Field. Facilities included barracks for 600, two hangars, a storehouse, gasoline storage, and runways. Barracks capacity eventually became 3,200. Los Alamitos. -- In the fall of 1941, extensions to the air facilities of the San Pedro area were provided by an agreement under which a new reserve air base was built at Los Alamitos, a short distance inland from San Pedro and terminal Island. Facilities provided were similar to those at the new naval reserve air bases at Dallas, Atlanta, and New Orleans. personnel capacity in 1945 was 5,200. Architectural concrete was used in the construction of these permanent buildings. plans for the 15,000-plane program, was located at Whidbey Island in Puget Sound facing the Strait of Juan de Fuca. This station was built to provide facilities for operation and maintenance of two patrol squadrons and one inshore patrol squadron, plus facilities for operation of four additional patrol squadrons. It became the principal operational field in the Puget Sound area. As originally developed, Whidbey Island provided barest operational buildings and utilities for seaplanes. The work amounted to clearing and grading a seaplane parking area, barracks, a pier, a hangar, and fuel storage. By 1945, accommodations for 4,300 officers and men had been provided. Gasoline storage was 2,850,000 gallons. New York. -- Under the 15,000 program, New York was to provide facilities for operation and maintenance of six patrol squadrons and one inshore patrol squadron, and facilities for the operation of one carrier air group. Floyd Bennett Field, site of a naval reserve air base and formerly the main commercial airport of the city of New York, had been acquired by the Navy the previous spring. The main construction contract was let December 17, ten days after the Japanese attacked Pearl Harbor. Construction included dredging two seaplane runways; building a seaplane hangar, 240 by 320 feet, to augment the four existing hangars; widening the runways to 300 feet and lengthening them to 5,000 feet; building a new 300-by-5,000-foot macadam runway; building four two-story 250-man frame barracks, and a maintenance shop, 122 by 62 feet. These structures, added to then-existent airport facilities, made the new Navy patrol base fully operational. Overall facilities in 1945 included twelve hangars, four 5,000-foot runways and personnel accommodation for 6,500. 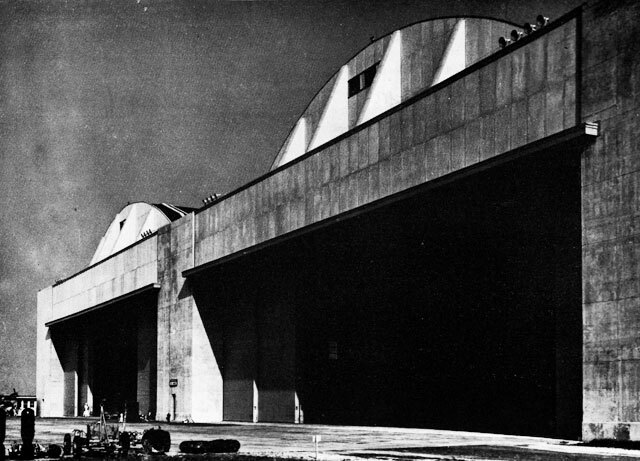 Landplane Hangar, Quonset Point, R.I.
operations needed those planes as fast as they could be built. Further, pilots would be needed as fast as American industry could build the planes. No longer could a handful of small reserve air bases and the two main training stations, however, large, handle the primary and intermediate pilot training load. The reserve air bases had to become full-sized primary training air stations. Pensacola and Corpus Christi had to confine their function to intermediate training. Operational training had to be extended. Within an air station system which was bursting its seams under the 15,000-plane program there was no room for a new program which demanded so great an expansion. Actually, because the pilot training rate had to be so high, the expansion contemplated, however, temporary it might be, was more than the total of facilities already in existence or under contract. New stations and more new fields were the obvious answer, and that answer was made almost entirely by work started in 1942. Two main classifications characterized the 1942 program: construction of new naval air stations, either at existing reserve air bases or at new sites; full development of out-lying fields. Facilities were also added at existing air stations. Minneapolis. -- Some work had already been done before the war at Minneapolis naval reserve air base, but immediately after January 1, 1942, expansion to air-station size began with the construction of barracks for 300 students and 600 enlisted men, instruction buildings, and storage facilities for 50,000 gallons of aviation gasoline. Temporary emergency personnel capacity of the station in 1945 was 5,200. Willow Grove. -- Private aviation facilities north of Philadelphia, at Willow Grove, Pa., were acquired, and construction for primary flight training activities similar to that undertaken at Minneapolis was initiated in January 1942. The highest capacity at Willow Grove was about 2,000 officers and men. Glenview. -- In Illinois, northwest of Chicago, the naval reserve air base at Glenview was built up by the construction of five H-type student barracks, three H-type enlisted barracks, two instruction buildings, extensions to the assembly and repair and to the engine overhaul buildings, a two-story supply storehouse, and a refrigerated storehouse. The storehouses and shop extensions were of brick and concrete construction; the others were of wood and concrete construction; the others were of wood frame. Construction continued throughout the war period, eventually providing emergency personnel accommodation for 8,800. Grosse Ile. -- Another Middle West naval reserve air base which began expansion in January was Grosse Ile, Mich. The work included barracks for 1,500 men, gasoline storage for 50,000 gallons, an instruction building, and general buildings. Later, several practice landing fields were built. Personnel capacity in 1945 was 5,300. Within the cylindrical section of this structure, men were whirled in a giant centrifuge, to test their individual "blackout" reactions. of a contract which included a hangar, an assembly and repair shop, student and enlisted barracks, and storage facilities for 200,000 gallons of gasoline. The station became a division point for Naval Air Transport Service. 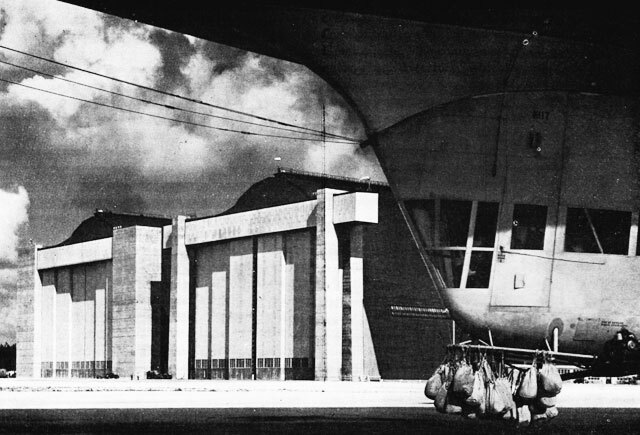 In 1945, it had five hangars and quarters for 6,400. Patuxent River. -- Also in February, construction began modestly at Patuxent River, Md., south of Annapolis and east of the District of Columbia, where the Patuxent River enters Chesapeake Bay. Eventually, the Patuxent River air station became the Navy's main flight-test station, a mammoth outgrowth of the overcrowded facilities at Anacostia. Initial work included site-preparation, dredging, filling, grading, and bulkhead construction. Seaplane ramps and parking areas, a landing field, barracks for 1,000 men, an assembly and repair shop, and gasoline storage for 200,000 gallons w3ere provided under the original contract. Emergency temporary personnel capacity in1945 was 13,000. Bunker Hill. -- Bunker Hill naval air station was built in Indiana, at a site where no previous naval aviation facilities had existed. Work under the initial contract included barracks and messing facilities for 800 students and 1,800 enlisted men; four 200-by-5,000-foot concrete runways, a 2,500-foot landing mat; two temporary wooden hangars, a small two-story wood-frame assembly and repair shop, 120 by 160 feet; a general storehouse, an aircraft storehouse, storage for 200,000 gallons of gasoline in pre-stressed concrete tanks, an operations building, and two instruction buildings. Ultimate personnel capacity was 6,300. Florida operational training stations. -- In April, the big project undertaken was the construction of a series of seven operational training stations with satellite fields, administratively under the jurisdiction of the operational training command at Jacksonville Existing municipal airfields were utilized and expanded. The first of the new Florida stations, Sanford, was put under contract April 25. Within the next two weeks, six more contracts, for work at Vero Beach, Lake City, Fort Lauderdale, Daytona Beach, Deland, and Melbourne, were let. Initial projects at each station included clearing and grading, warm-up platforms, one wooden hangar, barracks for 1,400 men and 312 officers, two instruction buildings, a dispensary, an aviation utility shop, and storage for 200,000 gallons of gasoline. of four 200-by-5,000-foot bituminous runways, quarters for 1,800 enlisted men and 800 cadets, a 25-bed dispensary, two instruction buildings, two temporary hangars, a small assembly and repair shop, gasoline storage, and two storehouses. Hutchinson and Ottumwa. -- Another primary training station was started in July, at Hutchinson, Kans. Runway, an octagonal landing mat, barracks for 650, three storehouses, a general aircraft storage building, and storage for 200,000 gallons of gasoline line were provided under the original project. In August, a primary training station with facilities similar to those provided at Hutchinson was placed under construction at Ottumwa, Iowa. By 1945, the personnel capacity at each station was about 5,000. Pasco. -- A somewhat larger inland training station at Pasco, in the south-central part of Washington, also was started in June. Constructed facilities included 2 runways, 36 barracks, three warehouses, a general and aircraft storehouse, an assembly and repair shop, and storage for 200,000 gallons of gasoline. Sixteen reserve fields were also cleared and surfaced. Clinton. -- At Clinton, Okla. a new naval air station for special experimental work was started on September 17, 1942. This station included two auxiliary fields and four other satellites. At the main station, four 6,000-foot runways, three 200-by-240-foot timber hangars, barracks for 4,000 men, a 100-bed dispensary, a general and aircraft storehouse, and storage for 317,000 gallons of gasoline were constructed. Brunswick and Atlantic City. -- In October, two stations -- Brunswick, Maine, and Atlantic City, N.J. -- were added to the operational base system which, from the standpoint of number of stations, had otherwise been completed before 1942. At Brunswick, three wooden hangars, runways and taxiways, barracks for 1,624 men, two general storehouses, and storage for 350,000 gallons of gasoline were built. The Atlantic City project was the same as that at Brunswick, except that only two hangars were built. Personnel capacity at each station was about 3,600 in 1945. Beaufort. -- The final significant air station to be put under construction in 1942 was at Beaufort, S.C. Initial work at this operational training station included barracks for 2,040 men, four nose hangars, storehouses, and gasoline storage for 350,000 gallons of gasoline. Later, a full hangar was built and total personnel capacity increased to 2,800. There were four 6,000-foot asphalt runways. The second significant phase of naval air station construction in 1942 was the expansion of the major air bases by the establishment of many new auxiliary fields and lesser satellites. In this manner only could the large fields care for the increased operational and training load which could not be passed to the new inland stations. As developed, some of the auxiliaries surpassed a number of the independent air stations in size. Some of the more notable auxiliary systems were those at Pensacola, Norfolk, Alameda, Corpus Christi, and Quonset Point. Pensacola. -- When the war began, Pensacola had three auxiliary airfields -- Corry, Saufley, and Ellyson. Under an agreement executed in April 1942, two new auxiliaries, Barin Field and Bronson Field, were built. At Barin, 20 miles west of the main station, three wooden hangars, barracks for 1,400 enlisted men and 450 cadets, storage for 215,000 gallons of gasoline, and a landing mat, 2,500 feet in diameter, were the facilities constructed. Bronson Field, 9 miles from the main station, was a combination landplane and seaplane station of temporary construction. One seaplane hangar, two seaplane ramps, two landplane hangars, and barracks for 150 cadets and 1,350 enlisted men were built. The largest of Pensacola's auxiliary fields, Whiting, 27 miles northeast of Pensacola, was started in November. Two separate landing fields were built. All buildings were between the two fields. Buildings put up under early agreements included quarters for 1,584 cadets, 1,900 enlisted men, and 580 officers, and two hangars, each with a control tower. Personnel facilities were more than doubled by 1945. Norfolk. -- In May, barracks for 132 men were ordered for each of five outlying fields under Norfolk administration -- Fentress, Pungo, Monogram, Creeds, and Oceana. At Fentress and Pungo, concrete runways were built. Later, in November, a fuller development of Norfolk's outlying facilities provided construction at four more fields. Harvey Point seaplane base was provided with barracks for 2,000 men, a timber hangar, and two seaplane ramps. Chincoteague facilities were quarters for 400 men and a storehouse. This was a unit of the naval air primary training command. The Manteo project included barracks for 300 men and a small wooden hangar. At Franklin Field a storehouse and a wooden hangar were built. Alameda. -- Alameda, whose function was similar to that of Norfolk in that it was the major air base of a great naval operating base area, in the spring of 1942 had an auxiliary station growth similar to that of Norfolk. Fields at Cotati, Concord, and Hollister were put under construction. Later, fields were built at Crows Landing, Santa Rosa, and South San Francisco. The South San Francisco facilities were built for use primarily by a private air line which operated during the war under Navy contract. The Navy had taken over the air line's facilities at Treasure Island. Corpus Christi. -- Auxiliary field construction at Corpus Christi was similar in extent to that which was performed at Pensacola. The new locations, all in Texas, were Rodd, Cabaniss, Cudduhy, and Kingsville fields. The contract for construction at those locations was let in October. Quonset Point. -- To increase flight training facilities at Quonset Point, it was necessary to expand the area of training to two auxiliary fields: Martha's Vineyard and Charlestown, R.I. At the first location, an island off the Massachusetts coast, three 150-by-3,500-foot runways were placed; temporary barracks for 464 men were constructed; a wooden hangar, 120 by 100 feet, was erected; and four 25,000-gallon concrete gasoline storage tanks were built. At Charlestown, the construction was identical, except that barracks were provided for 696 men. New work in 1943 proceeded primarily under the momentum of 1942 construction, consisting of additions to existing stations at a gradually diminishing rate. No new naval air stations were initiated during the year, although a few auxiliaries were put under construction. a storehouse, and a dispensary. In January 1943, NAS Astoria assumed cognizance over Tongue Point and a new auxiliary was established at North Bend, Oreg., on Coos Bay. Work at North Bend included barracks for 675 men, a wooden hangar, and storage for 100,000 gallons of gasoline. Corpus Christi, Beeville and Field 21305. -- Two new auxiliary fields at Corpus Christi, as well as additional work at the main station and at two existing auxiliaries, were covered by a new contract let in February. The two new fields were Beeville and Field 21305. At one, quarters for 600 cadets and 1,650 enlisted men, and a hangar were built; at the other, a hangar and quarters for 260 cadets and 450 enlisted men were provided. At the main station, quarters for 250 officers and almost 1,000 men were added. Quarters for 150 students and 900 enlisted men, as well as a hangar, comprised work at Kingsville. A small barracks was started at Rodd Field. Alameda, Fallon, Nev. -- A new auxiliary field for Alameda, at Fallon, Nev., was put under construction in November 1943. The work comprised two wood-frame hangars, a synthetic trainer building, barracks for 2,000 men, and a dispensary. Temporary emergency personnel capacity at Fallon was 4,200. There was gasoline storage for 200,000 gallons. Klamath Falls. -- Late in 1943, the Navy took over an existing municipal airport just outside the city of Klamath Falls, Oreg., and began construction of additional facilities needed to enable it to function as a naval air station. Field work was begun October 26, and the station was commissioned as NAS Klamath Falls on January 18, 1944. More than eighty buildings were constructed, including hangars, shops, storehouses, barracks, magazines, and a sewage-disposal plant. The station was disestablished January 1, 1946. During 1944, barracks and runway projects were undertaken at several stations. In April, barracks were started at Miami to accommodate 1,350 men, and work was begun on a project for 35 standard 228-man barracks at Alameda. During May and June, considerable work was done on runways at Hutchinson, Pasco, Glenview, San Diego, Miami, Vero Beach, Patuxent River, and Pensacola's outlying field at Evergreen, Ala.
A 1,200-foot carrier pier and an intermediate overhaul shop, 420 by 822 feet, of steel construction were started at Alameda in April and May. 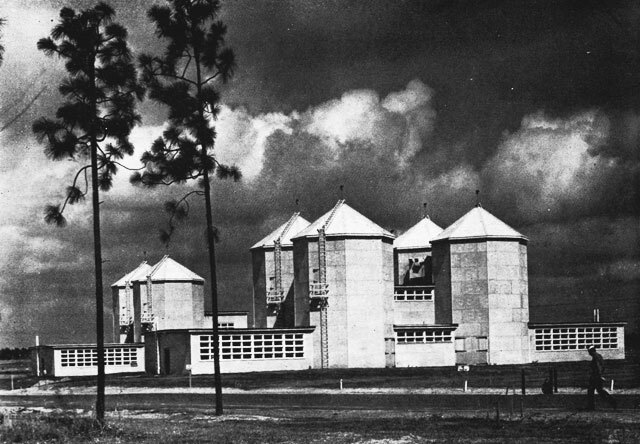 In the summer of 1944, three reinforced-concrete storehouses were built at Jacksonville, and at Banana River a hangar and two lean-tos were started. A steel engine overhaul shop, 400 by 280 feet, was begun at San Diego. In these silo-like structures, navigation students made celestial observations on simulated heavens. In 1945, significant construction began at three stations: Astoria, Alameda, and Pasco. At Astoria, a hangar was completed; at Alameda, two steel-frame hangars for seaplanes and a 6,809-foot breakwater were built; and a Pasco a hangar, 200 feet square, was constructed. During the construction program, the navy spent more than $10,000,000 on construction at each of 38 stations. Of these, 24 were heavier-than-air stations, 10 were lighter-than-air stations, and 4 were Marine Corps air stations. Of the 24 Navy heavier-than-air stations, 12 were principally operational stations, 10 were primary and intermediate training stations, and 2 were experimental stations. The operational stations were those which the Hepburn Board report, and subsequent studies in support of authorized aircraft expansions, designated as bases for patrol squadrons and carrier group facilities. The large stations discussed under the subject, operational bases, also served the training program in a vital and important manner by acting as operational training centers, the postgraduate schools for fliers. Alameda was an outstanding example among the new stations. Jacksonville, which was an operational station, was also an intermediate training station. Two of the pre-war stations, Norfolk and San Diego, were enlarged beyond their 1940 capacities. Exterior arches reduced the amount of concrete required in the roof shell. personnel facilities for 29,000, and 1,012,420 square feet of floor space in the assembly and repair shops. Aviation and other storage at the Norfolk naval air station covered about a million square feet, equivalent to that provided at a small supply depot. The level site acquired under the expansion authorized in accordance with Hepburn Board report recommendations was in part a marshy inlet from Willoughby Bay. Preparatory work included constructing a culvert to carry a small amount of flow from the inlet, filling and draining the marsh, and building sheet steel pile bulkheads, behind which hydraulic fill was deposited for land reclamation. More than 22,500,000 cubic yards of fill were deposited, providing 352 acres of new land for the air station. The entire new site was 1,785 acres. In the drainage project, about 30 miles of drainage ditches were built. In reclaimed areas, it was necessary to wait for land to settle before buildings could be built, and at various locations strata of quicksand necessitated the use of concrete mat or pile foundations. Most excavations were unwatered either by direct pumping or by the use of well points. Well points also were used to lower the groundwater level at proposed building sites, thus, hastening the needed ground settlement. Despite precautions, some differential settlement occurred in constructed buildings. Jacksonville. -- Originally conceived as a southeastern major air base for carrier groups and patrol squadrons, the naval air station at Jacksonville grew to include an air technical training center and the headquarters of the large operational training command which had cognizance of a network of operational training stations throughout Florida. built a large airfield at the north end, a group of operational air-base buildings, most of them permanent, a seaplane area, a group of temporary buildings for the air technical training center, a hospital, a storage area, and a sizable ammunition storage area. Two 6,000-foot runways and two 5,000-foot runways were built in the form of a triangle, the interior of which was almost entirely covered with a paved landing mat. Five seaplane ramps were built adjacent to the main administration area, and an assembly and repair hangar was erected. The Jacksonville site was generally flat and sandy, and was heavily wooded throughout much of its area. Construction problems attributable to site conditions were primarily those of combatting a high water-table. Trenches and other excavations had to be protected by well points, pumping, and sheathing. In the rainy season, trucks delivering materials frequently were unable to operate on the soft soil. Heavier structures were pile-supported; others were built on spread footings. Underground steam lines did not operate satisfactorily because of subsurface conditions. In the beginning, the supply of labor and material was adequate, but the construction of several other Navy and Army jobs in Florida, and the nation-wide competition for both construction elements gradually changed this, until labor of all kinds became difficult to obtain and materials could not be delivered at an adequate rate. Quonset Point. -- Between 1940 and 1943, a major air station was constructed at Quonset Point, a low sandy promontory on the west shore of Narragansett Bay, about 22 miles south of Providence, R.I. The original point was extended by hydraulic lifting to form most of the triangular area on which the station's four runways were built. The longest was 6,000 feet; one was 5,000 feet, long and the other two were each 4,000 feet in length. An 1,100-foot carrier pier, with rail service, four seaplane ramps, and a 1,200-foot assembly and repair shop were also built. Ground conditions at Quonset Point posed many problems during the course of construction. The unusually high water-table and predominantly sandy nature of the soil made it necessary to sheathe all trenches and most other excavations. Pumps or well-point systems also were used in connection with excavation work. Quicksand deposits were fond at three places, two of which could be avoided in construction. The third was at the site planned for fuel storage. Measures were undertaken to lower the water-level throughout the area by means of well-points and freezing, until heavy concrete mats could be placed atop piles to provide bases and anchors for the forty 25,000-gallon tanks which were built. Six dredges were used in the preparation of the carrier approach from the bay channel and in the preparation of the turning basin. air station was built 2 miles southeast of Brunswick, Maine. Almost 3 square miles in area, it had two 6,000-foot runways and one 4,500-foot runway. The Maine Central Railroad, which ran along the north side of the site, served the station by means of a spur. At taking, the site was a nearly level sandy area, with two 4,000-foot runways, part of a private airplane facility. A high water table made drainage a prerequisite to construction. Much of the work took place during the severe Maine winter, making it necessary to perform an unusual amount of thawing and ice removal, especially in runway construction. Carpenters were relatively easy to obtain, but other types of labor were difficult to get because of the proximity of wartime shipbuilding work. Whidbey Island. -- In the northwest, one of the most significant original air station developments of World War II was on Whidbey Island, 50 miles north of Seattle. A seaplane area was constructed at Crescent and Oak harbors, on the mainland side of the island, and a landplane area was constructed 4 miles northwest, facing the Strait of Juan de Fuca. At the seaplane area, two ramps were built into Crescent Harbor and one in Oak Harbor. The most important work at the seaplane area was dredging and hydraulic filling. Machinery units were towed from points as far away as the mouth of the Columbia River. Electric dredges required the full rated capacity of power-transmission lines from the mainland, and during the early part of the dredging, which extended over a period of 18 months, the work was plagued by a series of minor transmission breakdowns. During major grading operations it was impossible to obtain sufficient earth-moving equipment locally or even in the surrounding Puget Sound area. Orders for new units were placed with manufacturers, but because of priorities, some of these units were not delivered until after grading operations were completed. Each barrack was built to accommodate 2,000 men. to come from the mainland. A labor camp for 1,000 men was set up for unmarried workers, and low-cost housing was provided for married ones. Additional ferry service from nearby mainland-connected Camano Island was obtained. These measures helped somewhat, but, with plenty of work at less-isolated places, it was a constant struggle to obtain construction labor at Whidbey. The shortage was especially serious in the skilled trades. Disputes involving plumbing and heating trades seriously retarded overall progress during the early part of the war. Material deliveries were at the same slow rate as labor procurement, and even that was maintained only by considerable effort on the part of both the Navy and the contractor. However, an arrangement to take the total local-sawmill output assured a reasonable supply of lumber, and local supplies of aggregates were developed. Because delivery of materials and transportation of men had to take place over temporary roads which became impassable during wet weather, some delay on the land side was attributable to climatic conditions. During inclement periods, supervisory personnel traveled by horse. Storms also caused some damage to dredging equipment, washing the dredges ashore and destroying floating pipe lines. Alameda. -- The most important new air station constructed on the West Coast was Alameda. Its installations were built at the western ed of the city of Alameda, on the eastern shore of San Francisco Bay, just south of the Oakland end of the [San Francisco-Oakland] Bay Bridge. Most of the construction completed by V-J Day had been done on hydraulically filled ground. The site was rectangular, with the long axis in an east-west direction. A square flying field was built on the western half of the area; shops, hangars, administration and personnel structures occupied the eastern half. To the south of the building area was a seaplane area, including a lagoon enclosed by a breakwater and a jetty. South of the jetty, outside the main rectangle, were two carrier piers and a storage area. Five landplane runways in four directions ranged in length from 3,500 to 6,000 feet. location as a terminal for several years and had constructed three hangars, a water well and tank, and an administration building. That part of the field was known as the Alameda Airport. The Army commenced the development of the northeast corner in 1931 and completed improvements in 1935. The field was known as Benton Field. After acquiring the site in 1936, the Navy was able to utilize all dredging and filling work previously done, as well as the Army-built railroad spur, water supply and sewage works. Active development of the naval air station began in 1938. As construction at Alameda took place in a heavily populated transportation center the only difficulties of construction were those inherent in the wartime economy -- a gradually diminishing supply of labor and materials. Before the war, construction was permanent; after the war began, additional construction was of a temporary character. Buildings were founded on piles. San Diego. -- Originally, North Island, the naval air station site at San Diego, was occupied by both Army and Navy aeronautical facilities, but during the period between wars the Army withdrew and the Navy gradually built up this West Coast air facility. Located northwest of the city of Coronado, across Spanish Bight, North Island separates San Diego Bay from the Pacific Ocean. On its 2,000 acres, the Navy built two 6,000-foot heavy-duty runways, numerous shop, storage and personnel facilities. At the end of World War II, NAS San Diego had four aircraft carrier piers, more than 20 shops in the naval establishment, and extensive aviation storage facilities. Most of the construction essentials -- labor, materials, and machinery -- were plentiful when work began in 1940. The expansion of projects, combined with the increasing competition from other work of all kinds and in many places, made labor procurement more and more difficult as time went on. The fact that the island was connected with Coronado by a narrow causeway and in turn with the mainland by a ferry made transportation difficult when labor force reached full strength. Improvement and widening of the causeway alleviated the situation somewhat, but even that project created an additional traffic bottleneck during its construction. Material deliveries also were impaired by the condition of the mainland-to-station route. Construction of the heavy-duty runways took place after the contractors had had considerable experience in constructing runways at outlying fields, and after the Navy had determined how large and heavy its planes would be. 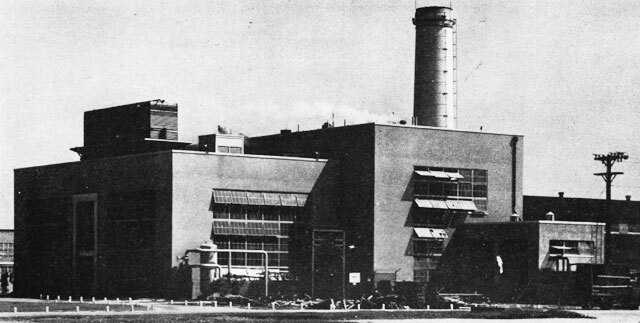 The asbestos-protected metal unit (background) was built in 1941; the brick unit (foreground) was added in 1944. The first, and only, major air training base to be established before the war was Corpus Christi. When, in 1942, the 27,500-plane program forced air training inland, six more training stations, each costing more than $10,000,000, were built at sites not previously used by the Navy. Pensacola, the training station which for years had graduated Navy fliers, was expanded both by construction at the main station and by the addition of new large auxiliaries. Corpus Christi. -- On a site, 10 miles southeast of Corpus Christi, facing Corpus Christi Bay to the north, Oso Creek to the west, and Laguna Madre to the east, the main naval air station of the Corpus Christi system was built. Construction took place within an area which was roughly rectangular in an east-west direction. The western third of the area was devoted to the landplane field; the waterfronts on the north and east were developed as seaplane areas. Four runways, three of them 5,000 feet long and the other 6,000 feet long, were built; 17 ramps served the seaplane areas. Site advantages included many acres of flat undeveloped land and nearness to a supply of aviation fuel. The original area was 2,050 acres of land, but hydraulic-fill operations increased it to 2,500 acres. Construction began in mid-1940, and by the spring of 1944 the station had facilities for 20,000 persons. As at Alameda, pre-war structures were permanent; most war-built structures, temporary. Construction conditions were not ideal. Beginning in the fall of 1940 and continuing until after mid-summer of 1941, the rainfall in the vicinity was twice that of normal, and additional operations were required to combat mud and standing water. It was necessary to use crawler-type tractors to tow truck-loads of material to the construction area. During the summer months, mud changed to dust in a few hours beneath the sun, and high winds created dust storms that slowed construction and damaged equipment. A major difficulty was encountered in stabilization of the soil. The entire site was covered with fine sand, overgrown with mesquite and other brush. Clearing the site loosened the soil so that it drifted into excavations, and failed to support equipment. Wind and sea acton made it necessary to construct quay walls and bulkheads along the waterfront. An unusual additional problem was presented by a wild burning gas well near the station. A salt solution from the well was carried by the winds over the station, causing minor construction difficulties, including the rotting of insulation on electric wiring, thereby exposing workmen to burns and shock. The fire was eventually extinguished, and the well was capped. the Pensacola main station were buildings for personnel, assembly and repair, and aircraft housing. The flying field was restricted in area by Pensacola Bay and by a knoll upon which officers quarters were situated. A maximum runway length of 2,750 feet made it necessary for the larger and faster types of aircraft to use auxiliary fields with longer runways. By August 1945, there were four landplane hangars and seven seaplane hangars, most of which were built before 1940; also, 750,000 square feet of assembly and repair facilities, and a total emergency capacity of 15,000 personnel. Soil at the station was sandy, with a high water table. Good foundations could be constructed, although well points were used to unwater most excavations. The labor supply was good and the turnover was low during most of the construction, although housing for labor became critical in 1942 and 1943, remaining thus throughout the war. A two-lane causeway across Bayou Grande, which separated the station from the city of Pensacola, was widened to four lanes to improve access to the air station. Norman. -- The naval air station and the naval air technical training center at Norman, Okla., comprised a second important area of construction during the war. The main station was built just northwest of the city of Norman, west of the Santa Fe Railway, in an area which had been farm land until shortly before the war, when a portion of it had been partly developed for a flying field operated by the University of Oklahoma. Four main runways, each 5,000 feet long, and two landing mats were built. The air technical training center was developed on a site, 2 miles southeast of Norman, also alongside the Santa Fe railroad. Most of the facilities there were barracks, instruction buildings, and storehouses. Construction at each site was predominantly temporary. Each site was level, and the soil was stable. The main construction difficulty was the unavailability of experienced labor in the area. Farmers and laborers from the surrounding villages were trained during the job. Also, there was competition from other large defense construction projects in the area. Despite these obstacles, the projects at Norman were completed in satisfactory time. Memphis. -- The naval air station and air technical training center at Memphis were built at the same time as those at Norman, to provide similar facilities. The installations were similar, even to the construction of four 5,000-foot runways and two landing mats. The Memphis site was 20 miles north of the city of Memphis, near the Mississippi River. The terrain was somewhat rolling, a condition which necessitated considerable grading. Stripping the stable topsoil exposed pockets of wet and spongy clay, which had to be removed and replaced with compacted material. Some of the pockets extended 12 feet below finish grade. The site also required an extensive drainage system. In general, labor was plentiful, except in the mechanical trades. The contractor recruited electricians, steamfitters, and other mechanical tradesmen from distant cities. Material deliveries were slow. Ottumwa. -- In the Ninth Naval District, four large primary training stations were built at new Navy sites. Two of these, Ottumwa, Iowa, and Hutchinson, Kans. were built under two contracts which were let at the same time for similar amounts of facilities. As built, Ottumwa had two 5,000-foot runways and two octagonal landing mats adjacent to the runways. The site selected was 1,440 acres of farm land, level except for some eroded areas near the edges. It was 6 miles north of the city of Ottumwa, in southeastern Iowa. A surface loam covered a deep clay layer which allowed little natural drainage, so extensive field-tile drains were installed as part of the construction project. Meanwhile, however, the poor drainage caused much trouble, because heavy equipment would bog quickly in wet weather. Hutchinson. -- The original Hutchinson layout was similar to that at Ottumwa, except that a third runway, also 5,000 feet long, was added. Later construction extended all three to 7,000 feet in length and added a fourth 7,000-foot runway. Like Ottumwa. Hutchinson had two octagonal landing mats within the runway area. The site taken by the Navy was four complete sections (4 square miles), of farm land, 10 miles south of Hutchinson, Kans. The terrain was generally flat to rolling, with good surface drainage and two types of soil, a loam with a narrow stability range and a sandy loam of wider stability. The second made good runway subgrade material. early in the job, any delay attributable to that meteorological eccentricity was not much more than the duration of the downpour, about 17 days. Equipment was plentiful; most materials were delivered on time; and labor was adequate in numbers if not in experience. Olathe. -- Olathe, 25 miles from Kansas City, Kans., was the site of an airport on which the Civil Aeronautics Authority had started runway construction before the Navy took possession. The land was gently rolling, and drained from a high area near the middle of the north boundary. Because of a high clay content in the soil and limestone bedrock at depths varying from 5 to 15 feet, almost all drainage was surface drainage. Three 5,000-foot runways were built, similar to those at Hutchinson. A landing mat covered most of the field area. Building facilities for primary training and Naval Air Transport Service were erected. The necessity of performing cut-and-fill operations in the clay soil during the winter presented some difficulties, but in general the work on the major portion of the station proceeded without undue setbacks. Bunker Hill. -- The naval air station at Bunker Hill was similar to those at Ottumwa and Hutchinson in that two main 5,000-foot runways intersected, and the building area, in plan, pointed toward the intersection. Two other 5,000-foot runways and a large landing mat completed the flight facilities. The station was built on a level site, formerly farm land, 55 miles east of Indianapolis. Most construction was conducted in good weather. Labor was plentiful, although the skilled trades were of poor quality. There was some difficulty in obtaining enough heavy construction equipment because of the volume of war work under way in the Midwest. Patuxent River. -- When the Navy's air experimental work outgrew its modest limits at Anacostia, a new site, reasonably close to the Navy Department and situated advantageously for great expansion, was sought. As built during the war, Patuxent River served this original purpose and also became the important East Coast terminal for Naval Air Transport Service. Its 10,000-foot runway became the longest in the continental naval establishment, and it had two 6,500-foot runways. Three seaplane area, with one, one, and two ramps, respectively, together with secondary runways and taxiways, completed the major flight facilities. Twin Landplane Hangars, Patuxent River, Md. These hangars were built with timber arches and six-leaf sliding doors carried on tower and girder beams. reinforced-concrete hangars. Each was built with arch ribs above 160-foot-wide concrete barrel roofs. The arch ribs abutted, at the sides and center of each building, into concrete frames which housed offices and minor shops. About 60 miles southeast of Washington, the site selected for the Patuxent River base was bounded on the east by the Chesapeake Bay and on the north by the Patuxent River. It was an area of tilled flat farm land, wooded hills, swamps, and small creeks. Unstable fine sand and clay soil made access to the construction work difficult in the early stages. Work was further handicapped by slow material deliveries and inferior labor. After more than $20,000,000 had been spent on the larger of the two early contracts, the rate of progress was considered unsatisfactory. The contract was terminated and a new one was executed with another contractor, who finished the land construction of the station's early development. Most construction of the later war months was permanent. Clinton. -- A second new experimental air station was established 17 miles south-west of Clinton, Okla., in an area known as Burns Flat. Construction included four runways, ranging in length from 4,500 feet to 6,500 feet, three large hangars, and extensive administration and personnel facilities. The area was gently rolling farm land of poor quality. Much of the surface material was unstable, and in runway construction it was necessary to remove the unstable material and replace it with good borrow. Construction progress was marked with the usual difficulties of an isolated job; slow material deliveries, inexperienced and insufficient labor, especially in the skilled brackets. comprised the naval aircraft factory, the naval aircraft experimental station, the naval aircraft modification unit, and the naval auxiliary air station at Mustin Field. The center was the outgrowth of the naval aircraft factory, which was authorized for establishment at the Philadelphia Navy Yard on July 27, 1917, to supplement private industry in the manufacture of naval aircraft during World War I. After the war, the factory was reorganized as an experimental plant in which new types of aircraft were developed for tests prior to their approval for general service use. In 1920, a physical testing laboratory was established, and the following year the factory was placed under the cognizance of the newly organized Bureau of Aeronautics. In 1924, the aeronautical engine laboratory was transferred to the factory from the Washington Navy Yard, and Mustin Field was opened as an adjunct. In the decade that followed, construction was not a major accomplishment, although a foundry, two hangars, a dual heat treatment building, and a transformer house were added. 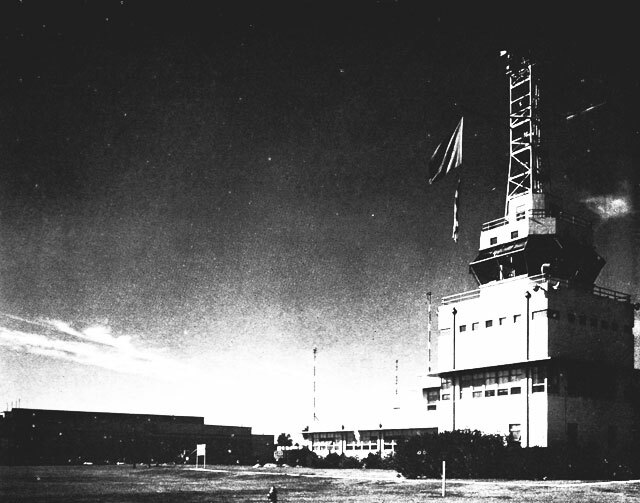 In March of 1934, the physical testing laboratory was reorganized as the aeronautical materials laboratory and an engine test house was constructed. 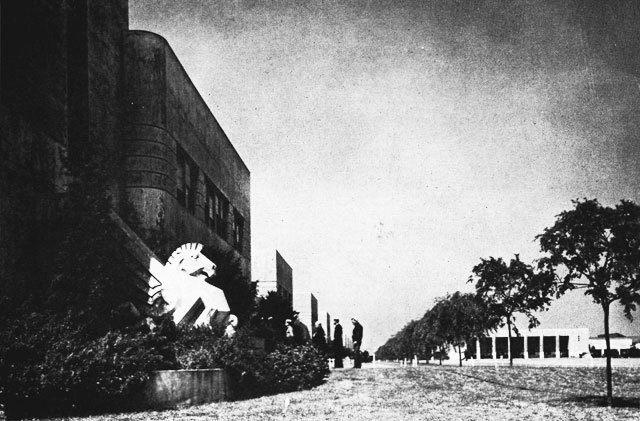 In 1936, a machine shop and a final assembly building were built. Then, in May 1938, with the 3,000-plane program authorized, construction was immediately begun at the naval aircraft factory to meet the requirements of the expanded program. 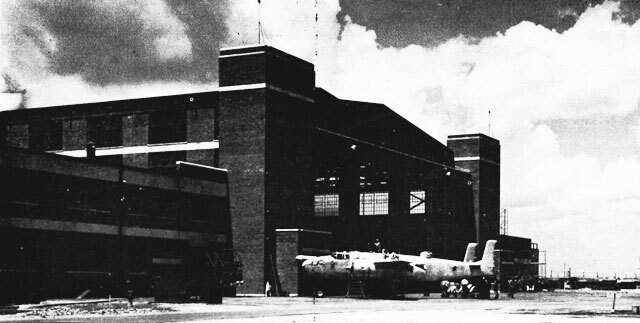 A concrete administration building, a hangar, a platform with landing and arresting gear, and storehouse for inflammable material were erected in 1938. Additional storehouses were added in 1939 and 1904, and a laboratory and barracks were included in the facilities constructed in 1941. With the actual outbreak of war, construction was stepped up. Another laboratory was constructed in 1942, together with additional storehouses, extensions to existing fuel and power systems, and miscellaneous buildings. Early in 1942, the supply department, which had been established in October 1941, was detached from the factory and the naval aviation supply depot was established in North Philadelphia. In July 1943, the naval air materials center was established. to the proper functioning of the center. Mustin Field was to furnish support for shop and flight-testing facilities and for flight operational activities. A year later, the aircraft modification unit was moved to Johnsville, Pa., where it took over facilities used by the Brewster Aeronautical Corporation, a Defense Plant Corporation unit, together with an adjacent flying field. The three other members of the center remained in the area adjacent to the navy yard, where additional facilities were constructed, including a seaplane hangar, and extensions were made to existing facilities. A $2,000,000 extension to the aeronautical engine laboratory was completed in 1945. At the end of the war construction program, the naval air material center occupied 500 acres adjacent to the Philadelphia Navy Yard, and 369 acres at the modification unit at Johnsville. Seven hangars, including two seaplane hangars, three bituminous runways, two seaplane ramps, a quarter of a million square yards of concrete and composite aircraft parking as well as nearly a hundred buildings had been constructed. Three landplane hangars and three runways had been added to the facilities at Johnsville. Although airplanes performed most of the functions of the Navy's air arm, one type of activity, coastal anti-submarine patrol, was conducted by lighter-than-air craft. The semirigid airships were used advantageously for coastwise and harbor-entrance observation because of their ability to slow down and however for immediate scrutiny of suspected objects. Radio was used to warn shore stations and surface craft of danger. Depth bombs were used for attack; machine guns, primarily for defense. At the beginning of the period of National Defense, the Navy had one lighter-than-air station, at Lakeurst, N.J. Established in 1921, the station's main features in 1940 were three 3,000-foot runways, three minor hangars, and an old steel hangar, built during World War I, which, in other years, had housed several of the world's great airships. Another station, Moffett Field, at Sunnyvale, in the San Francisco Bay area, had formerly been used by the Navy, primarily to base the dirigible airship Macon. When that ship was lost, in 1935, the station was turned over to the Army, which held it until 1942. In 1942, Moffett Field was reestablished as a naval lighter-than-air station, part of a system of such facilities which had been planned in 1940. In the basic plan for wartime lighter-than-air station construction, it was proposed that, in addition to expansion at Lakehurst, new stations be located in the Boston, Cape May, Cape Hatteras, southern Florida, Los Angeles, San Francisco, and Puget Sound areas. As finally developed in 1943, lighter-than-air facilities included, in addition to Lakehurst and Moffett Field, stations at South Weymouth, Mass., Weeksville, N.C., Glynco, Ga., Richmond, Fla., Houma, La., Hitchcock, Texas, Santa Ana, Calif., and Tillamook, Oreg. In the initial program, accommodations were provided for six airships at each station. This was later increased to twelve at seven of the stations and to eighteen at Richmond, as a result of an increase in the authorized strength to 200 airships, many of which were scheduled for patrol operations at outlying bases. In June 1941, shortly before Congress completed action on the Navy's proposed lighter-than-air station program, work began at Lakehurst on a project which included a steel airship overhaul and fitting-out hangar, 610 feet long, and a similar hangar for training ships, 400 feet long. Each was 214 feet wide and 112 feet high. The Second Deficiency Appropriation Bill for 1941, passed July 3, 1941, authorized money for the construction of facilities to accommodate 48 airships, as requested in 1940. Six airships used for coastal patrol were housed in each hangar. original contract included a steel hangar, 960 feet long, 328 feet wide, and 190 feet high, helium storage and service, barracks for 228 men, a power plant, landing mat, and a mobile mooring mast. Weeksville, N.C., serving the Cape Hatteras area, was the second new station. Construction there, on facilities similar to those at South Weymouth, began in October. These two stations were the only new ones begun before Pearl Harbor. Immediately after Germany declared war on the United States, submarine attacks began to exact an appalling toll from coastwise as well as trans-ocean American shipping. The remainder of the 1940 plan for lighter-than-air and patrol of coastal lanes had to be put into effect promptly. While negotiations were under way to obtain cost-plus-a-fixed-fee contracts for the various sites selected, three minor agreements for construction of barracks were made with contractors at Weeksville, South Weymouth, and Lakehurst. The first new wartime lighter-than-air station was at Richmond, Fla., where work began in April 1942. The project was similar to those at Weeksville and South Weymouth except that the six-airship hangar, 1,058 feet long and 297 feet wide, was designed by the Bureau for timber construction because of war-imposed restrictions on the use of steel. This hangar and its sixteen Navy successors have been described as the largest timber structures in the world. To minimize the fire hazard inherent in the use of wood construction, the timber was fireproofed by impregnation methods. This station was provided with barracks for 456 men. Note orange-peel doors, pivoted to the hangar peak and moved by built-in electric trucks which ride on rails. Work also began in April 1942, on the first West Coast station, Santa Ana in the Los Angeles area. Like Richmond, Santa Ana was modeled after South Weymouth and Weeksville. Barracks were provided for 456 men. Up to this time, each new station had been located in an area specified in the 1940 plan. If the plan had been carried out completely and without modification, only three more stations, one in the Cape May area and two on the Pacific Coast, would have been built. German submarine activity, however, was demanding greater protection to the oil tanker route from the Gulf of Mexico to the East Coast. 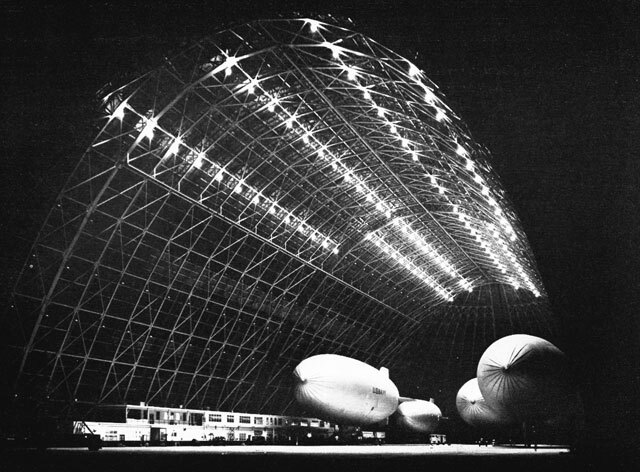 In the sumer of 1942, work began on six-airship stations at Hitchcock, Texas, Houma, La., and Glynco, Ga. At each, the single large hangar, of the new Bureau of Yards and Docks timber design, was constructed. Meanwhile, the two remaining Pacific Coast lighter-than-air stations were being established. In July, work began on a standard station at Tillamook, and at the same time the Navy started adapting existing facilities at Moffett Field for anti-submarine patrol use. Hardly had the contract been signed for the last project of the initial program, when the Navy began a second program, intended to accommodate an additional six-airship squadron at each station. The first enlargement was put under contract at Weeksville in September 1942. The main feature of the new work was a timber hangar to supplement the function of the steel hangar already under construction. Corresponding increases in fueling, helium, personnel, and other facilities were included. Four other stations, Moffett Field, Santa Ana, Lakehurst, and Glynco, were enlarged, under September agreements, by the construction of one timber hangar each, together with supporting facilities. Conforming agreements were negotiated for Tillamook and South Weymouth in October, and the program was completely under way by November, when the second Richmond six-airship project was started. Second hangars also were ordered for Hitchcock and Houma, but the orders were later modified by instructions to ship the materials elsewhere. Materials for the second Houma hangar were intended for erection in Trinidad, but the project was not completed. Materials for the second Hitchcock hangar were adapted to the construction of other types of facilities at Hutchinson, Kans., and Astoria, Oreg. and Lakehurst, each had one timber hangar added to their facilities by construction which began during the first three months of 1943. As construction on the last of the great timber hangars neared completion in mid-1943, the Bureau of Yards and Docks initiated a program which was to contribute significantly to the life expectancy of the Navy's larger timber structures, especially the lighter-than-air hangars. Because it had been necessary to use unseasoned lumber in timber structures, bolted connections which had been tight at the time of construction were becoming loose; at many places, dangerously so. The first contract, for inspection, engineering, and repair of timber structures at various locations in the First, Third, Fourth and Fifth Naval Districts, was let in June. It was followed, in July, by a similar contract for the Sixth, Seventh, Eighth, and Ninth Districts; in February 1944, by one for the West Coast districts. The contracts established a systematic program for the maintenance of timber trusses in good condition during the in-place seasoning process. Bolt-tightening and other maintenance were carried on in all of the Navy's timber lighter-than-air hangars, as well as in hundreds of other lesser structures. Site selection criteria for new lighter-than-air facilities were simple. First, the stations had to be in areas of strategic value to coastal patrol. Second, the stations had to be located near the coasts, to avoid non-patrol airship mileage. Third, they had to be located in flat areas behind natural windbreaks, such as coastal groves, dunes, or mountains. This was to avoid the landing and take-off hazards which unbroken sea winds would impose. Many available sites which fulfilled these simple requirements were difficult construction sites, especially where it was necessary to place the heavy loads of hangar arches on unstable coastal or river-plain soils. Where such a site was selected, pile support for major structures was necessary. In some locations, mucky topsoil had to be replaced with stable material to give proper foundation for landing mats, floors, streets, and minor buildings such as personnel and administration facilities. Problems of labor and material supply were not uniform. Some stations were near population centers; others, isolated; and the labor problem varied in seriousness, accordingly. Some were near the sources of timber supply and distant from machinery sources; others were handicapped in an opposite manner; still others were in the fortunate position of having ready access to most major classes of materials. Except for Lakehurst, the parent station, where training complicated the picture, facilities were built in multiples of one-squadron units. Each unit consisted of a six-airship hangar with shop and administration facilities in lean-tos, subsistence and housing for about 500 men and 100 officers, purification and storage service for helium, and fuel service. Capacities of the helium and fuel systems varied considerably among the stations. The central element of the squadron unit, the hangar, was constructed of timber on all projects initiated after war began. Only two large steel hangars were built, those started in 1941 at South Weymouth and Weeksville. The timber hangars consisted of a shell, which was helf-egg-shaped in cross-section, and two end doors. The shell was 1,000 feet long, 196 feet wide, and 170 feet high, supported by a series of 51 transverse timber arch bents, and wood sheathed. The lower 24 feet of the shell was framed by a series of reinforced-concrete bents which transferred the arch loads to the foundations. Lean-tos within the bents housed offices, classrooms, and shops. All hangars except one at Houma were provided with vertical flatleaf sliding doors with supporting concrete tower bents. Each door opened from the center; three leaves were telescoped to a clear position on each side of the entrance. The half-dome doors at Houma were self-supporting assemblies of half-arches which rose from points on a semi-circle, of radius equal to half the width of the hangar, to a common peak. When not in use, these doors were rolled on rails to a position alongside the hangar. Overall dimensions were the same in the shell of each hangar. Sizes of members, however, varied as dictated by the different conditions of wind, snow-load, and other loading conditions at the various locations. Two Timber LTA Hangars, Richmond, Fla. Note two different types of door bents. acquired the site in 1941. Like nearby Cohasset, where a new naval magazine was established, it was an area of rocks, woods, and swamps. Development of the field required removal of peat to a depth of 20 feet in some places; in others, rock removal was necessary. Heavy building loads were supported on rock or piles, whichever the conditions of each foundation position required. Two squadron units were built. Arches for the first large hangar, of steel, were erected by the use of two stiff-leg derricks mounted on a steel traveler, which, in turn, rode on seven railroad flatcars. An arch was erected from a single setup of the traveler; then the traveler was moved on temporary rails to the next arch position. 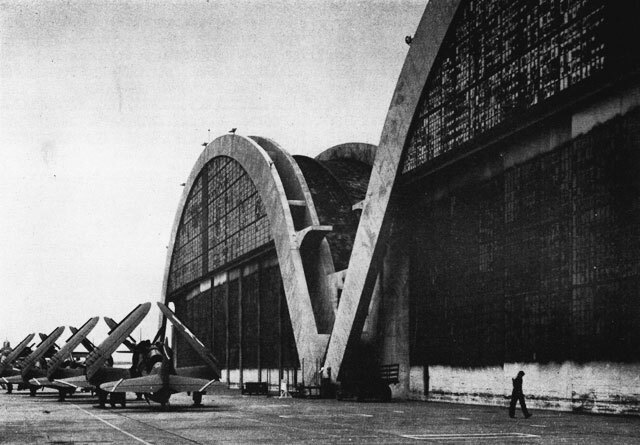 The completed hangar had rail-mounted orange-peel doors at each end. The erection of the timber hangar for South Weymouth's second squadron was conducted in the same manner as that for the steel hangar. Four to eight panel sections of the arches were fabricated on the ground, hoisted to place, and bolted together. Lakehurst. The parent lighter-than-air station, Lakehurst had been established in central New Jersey, 15 miles from the coast, in 1921. The site presented no unusual construction problems, although its relative isolation made labor procurement difficult when war industries and construction in the New York and Philadelphia areas made it unnecessary for labor to go outside those cities for work. Arches for Lakehurst's two timber hangars were prefabricated in four sections on the ground and raised into position by two track-mounted triangular travelers which had previously been used in the construction of the George Washington Bridge over the Hudson River at New York. from a two-squadron base at Weeksville, N.C., 50 miles south of Norfolk and 25 miles from the ocean, on a fertile 765-acre site which had been used for farming. Soil conditions were adequate for the support of temporary buildings on spread footings. Landing mat construction in wet weather was difficult because impervious material under thin overburden prevented ready drainage. A steel hangar and a timber hangar were built. The steel hangar was pile-supported. Erection of each hangar was performed with two large derricks mounted on travelers with towers 120 feet high. Steel arch members were erected in place with the aid of false-work. As at South Weymouth, segments of the timber arches were assembled on the ground and raised to position for connection to adjacent segments. Glynco. -- Glynco was built near the Georgia coast, 6 miles north of Brunswick. Although the unimproved 2,420-acre site was nowhere more than 10 feet above sea level, it had good surface drainage and was well adapted to the construction of light buildings. Sufficient labor could not be obtained in the Brunswick area, and it was necessary to recruit to a 300-miles radius. Richmond. -- The Richmond station was constructed in a pine forest, 17 miles south of Miami and 5 miles inland from Biscayne bay. The site was a gently rolling humus-covered limestone area, about 10 feet above sea-level. It was well drained and afforded excellent foundations for temporary buildings. Two operation squadron units were built there. Two giant timber hangars, the second and third to be built there, were erected. 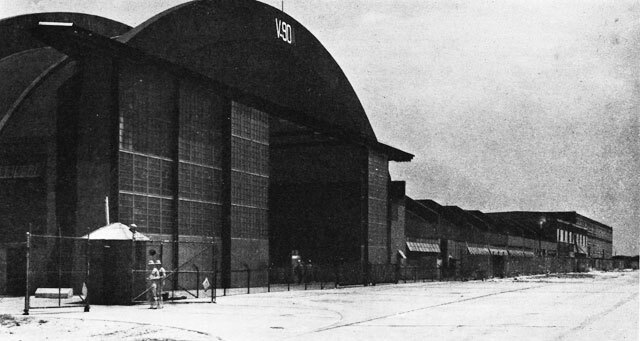 The first one, originally intended as an operations hangar, was used as a major overhaul hangar. Bearing tests, conducted before construction of the first hangar, indicated the need for spread footings. Experience, however, revealed a non-uniform bearing value, presumably caused by the presence of caverns in the limestone. Grade beams were used on the first hangar to carry the arch loads over areas of low supporting value. Soon after the hangar's completion the door structures began to settle. Extensive jacking and subsurface grouting brought the frames to grade and prevented further settling. The second and third hangars were partially supported on concrete piles. Erection procedure was similar to that at South Weymouth. Houma. -- The 613-acre site of a Coast Guard amphibious airplane base and a private airport at Houma, 55 miles southwest of New Orleans, was adapted to naval lighter-than-air station use. The Navy acquired additional land to increase the area to 1,743 acres, and built levees to protect its new holdings. Facilities for one squadron unit were built. The project was slowed continuously by the difficulty of obtaining labor, delays in materials deliveries, and inadequate drainage, which bogged heavy equipment. The arch bents of the hangars were erected from a timber scaffold which moved on wooden rollers. The first eight panels of the arches were fabricated on the ground and set by crane. The remainder of each arch was built in place, piece by piece. Pile foundations were used. The unique half-dome doors were used at Houma. Hitchcock. -- The 3,000-acre Hitchcock lighter-than-air station was located 20 miles inland from the Gulf Coast city of Galveston. All drainage of the flat area was from surface ditches because of the impervious nature of the subsoil. At at Houma, facilities were provided for one six-airship squadron. Arches for the timber hangar were erected from a traveling scaffold which was designed to withstand the high wind velocities of that section of the Gulf Coast. Santa Ana. -- High, gusty winds, locally called Santa Anas, twice blew down erected hangar trusses during the construction of the southern California lighter-than-air station at Santa Ana, 35 miles southeast of Los Angeles and 10 miles from the ocean. The area had been extensively cultivated for many years, so it needed little preparation for the construction of lighter-than-air facilities. Two pile-supported timber hangars and their accompanying services were built. Erection was piece-by-piece, from a movable scaffold mounted on 18 flatcars. arches were supported into four sections, raised by two stiff-leg booms, and rebolted. Foggy weather frequently made telephone communication necessary between crane operators and men aloft. Rain made earth-moving a difficult and expensive undertaking. Moffett Field. -- Navy war construction at Moffett Field added two timber hangars and associated facilities to the prewar station, the dominant feature of which had been a steel hangar. The new hangars were pile-supported and erected piece-by-piece, from scaffolding. Quantico. -- The expansion of ground facilities for the Marine Corps Air Force was begun in July of 1940, when a contract was made for additional facilities at the Marine Corps flying field at Quantico, Va. A landplane steel-frame hangar was constructed to meet increased operational needs. The aircraft storehouse was extended, and part of the extension was used as an assembly and repair shop. Gasoline storage facilities were supplemented with steel tanks of 30,000 gallons capacity. Three temporary storehouses of steel frame with asbestos-protected metal siding were built, and the existing storehouse was extended with an additional 190,000 cubic feet of space. Barracks for 600 men were built of reinforced concrete and brick construction. Parris Island. -- About the same time that work was started at Quantico, some additions at Page Field, Parris Island, were begun. In this work, two runways, 200 feet wide and 3,000 feet long, were paved with sand asphalt. Steel tanks, partly underground, were added to increase gasoline storage facilities by 120,000 gallons. Also, a two-story wood-frame barrack, 92 by 205 feet, was erected. In October 1940, the erection of a two-story landplane hangar, 130 by 210 feet, of steel-frame construction was started at Parris Island. Cherry Point. -- The Marine Corps air station at Cherry Point, N.C., was begun in 1941. Planned to be a permanent station, Cherry Point was built as an operational airfield with eight paved runways and complete facilities. The eight runways and taxiways were surfaced with a limestone base course and a bituminous pavement. Most of the buildings were of semi-permanent construction. Hangar space, with a floor area of approximately 90,000 square feet, was provided in each of two steel-frame buildings with asbestos-protected steel siding and steel roof trusses. Barracks for approximately 3,800 men were built. For gasoline storage, a 425,000-gallon water displacement system was installed in underground steel tanks. A 320,000-gallon concrete water reservoir was required to operate this fuel-storage system. Two storehouses were built, one a general storehouse, 235 by 560 feet, with brick walls and 12-inch brick firewalls, 140 feet apart. The aircraft storehouse was built with brick walls to window sill height, and steel-frame construction covered with asbestos-protected metal, above; the roof trusses were steel. Shops were built of the same construction as the aircraft storehouse. In April 1942, a supplemental agreement to the original contract at Cherry Point initiated barracks, similar to those already built, to house 3,000 more men. A large assembly and repair shop also was included in the agreement. Construction of the shop was partly wood frame, partly steel frame, and partly reinforced concrete. In July of 1942, a change order was issued to the contract at Cherry Point, creating an outlying field at Atlantic, N.C. Work included construction of two runways and taxiways, paved with sand asphalt. Barracks for 80 men, an operations building, and other structures were installed in frame construction. Assembly and Repair Shop Hangar, Cherry Point, N.C.
asphalt siding. This work was rushed to completion by the end of the year. Several changes and additions were subsequently made to the station. In the middle of January 1943, work was begun on an outlying field at Oak Grove. Two sand asphalt surfaced runways were put in; four barracks, together with messing facilities were erected; and an operations building, constructed. At the main station in February 1943, a wood-frame building was erected to house synthetic training. This was a two-story irregularly shaped building with a floor area of 26,400 square feet. Ten other buildings were erected for use as squadron administration buildings and workshops. Toward the end of April, work was begun at two other outlying fields, Atlantic and Bogue, followed by similar work at Oak Grove. Wood-frame barracks for about 700 men were erected, and each field was supplied with a hangar having a floor area of 15,000 square feet. These were of wood-frame construction with wood roof trusses. El Toro. -- Early in April 1942, work began on a Marine Corps air station at El Toro, Calif., to provide facilities necessary to train and regroup Fleet Marine combat units. The station capacity included two Fleet Marine aviation groups, It was constructed in two symmetrical units, one for each group. Three runways were paved with 3 inches of asphalt concrete on a compacted base course of 6-inch select fill. Taxiways connected the ends of the runways. Most of the buildings were constructed with wood frames on concrete foundations. These included two administration and instruction buildings, two parachute buildings with lofts for drying parachutes, two aircraft maintenance hangars with floor areas of 19,500 square feet each, enough two-story 250-man barracks for the station's 3,500 men, and messing facilities in separate mess halls. Gasoline storage facilities for 1,550,000 gallons were provided in underground pre-stressed reinforced concrete tanks. On January 1, 1943, barracks for 600 men were added. These were 2-story structures of wood-frame construction. the Kern County airport. At Mojave, 90 buildings were constructed; at El Centro, 62. The stations were similar, each having three runways and other comparable facilities. existing runways were extended and paved, and taxiways were installed. Buildings were temporary wood-frame structures with precut lumber used wherever possible. At each station there were a maintenance hangar, shops, and storehouses to maintain and supply 80 planes, and barracks and messing facilities were provided for 2,000 men. Gasoline storage tanks of pre-stressed reinforced concrete were installed underground, providing facilities for 500,000 gallons at Mojave and 800,000 gallons at El Centro. At El Centro it was necessary to air condition the habitable buildings. Edenton. -- In August of 1942, construction was begun on what was originally intended to be a Marine Corps amphibious glider base, located 5 miles southeast of Edenton, N.C., on Albemarle Sound. After construction was begun, the designation and purpose of this station was changed to an operational and training station for landplanes, with a corresponding reduction in the scope of the seaplane facilities, and the addition, by change orders to the contract, of celestial navigational trainers, additional gasoline storage facilities, photographic building, and other necessary facilities. Three 6,000-foot runways were paved with sand asphalt over a crushed-stone base course. A 120-by-200-foot hangar, with brick walls to the height of the window sills and frame construction above, was built. A gasoline storage system for 270,000 gallons was installed in underground steel tanks. A 900-foot bulkhead of creosoted piles and sheet piling was placed along the shoreline to provide seaplane waterfront area. A parking area was furnished adjacent to the bulkhead, and barracks and messing facilities for 1,000 men were built. A brick cold storage building, 64 by 142 feet, was erected. Santa Barbara. -- At the same time, but on the Pacific Coast, construction was begun on the reconversion of the Santa Barbara airport at Goleta, Calif., into a Marine Corps air station. Temporary wood-=frame barracks for 1,800 men, and repair shops of similar construction were provided. Existing runways were lengthened, and taxiways and warmup aprons added. Concrete underground storage tanks for 750,000 gallons of gasoline and 100,000 gallons of fuel oil were also added. Eagle Mountain Lake. -- In September 1942, shortly after the work at Santa Barbara was initiated, work was begun on a Marine Corps glider base at Eagle Mountain Lake, Texas. Later, the function of this station was changed to that of a Marine Corps air station. The project included two auxiliary fields -- one on Bridgeport Lake; the other, located between Rhone and Boyd, Texas, was called Rhone Field. The main station had facilities for both landplane and seaplane operation; Rhone Field was equipped for landplanes only, and the field on Bridgeport Lake accommodated seaplanes only. At the main base, three runways were paved with asphaltic concrete on top of a compacted base course. Barracks for 1,200 men were provided in wood-frame buildings with asbestos siding. Concrete underground tanks were supplied for a 25,000-gallon gasoline-storage system. Masonry buildings were erected for storehouses, parachute shops, and mess halls. At Rhone Field a graded landing area, barracks for 750 men, shop and storage facilities, and a nose hangar were built. At Bridgeport Lake, the only facilities provided were an administration building, boathouse, graded seaplane ramp, and seaplane parking area. Cherry Point. -- The station at Cherry Point, which at its peak of activity accommodated 800 aircraft, was located in the same general area as the new Marine Corps training command at Camp Lejeune, for convenience in coordinating Marine Corps air and ground training. Within a 30-mile radius of the main station, three outlying fields were constructed as additions to the original contract. These were Atlantic, one mile northwest of Atlantic; Bogue, on Bogue Sound; and Oak Grove, 3 miles northwest of Pollockville, N.C. The land at Cherry Point was formerly used for fishing, hunting, and the cultivation of a few general crops. Much of the land was densely wooded swamp and marsh. Most of the construction was of a semi-permanent nature. Overhauled aircraft engines were given operational tests in these structures. station were constructed, mostly of steel frame with asbestos-protected metal siding, and brick to window-sill height. The outlying fields were similar to one another, having two sand-asphalt surfaced runways and necessary taxiways, and barracks for 1,000 men. At each field, one hangar building, with approximately 15,000 square feet of floor area, and three shops were built. Construction took place in an isolated area where hardly any skilled labor was available. At first, common labor was plentiful, but up-grading of common labor to the skilled rate, necessary both to fill the skilled rolls and to keep labor on the job, depleted the common-labor supply during the four years of active construction at Cherry Point. A tough site-clearing problem was presented by a great number of stumps, left by fires and cutting operations. Most of them were removed by blasting. In the runway area the contractor removed much unstable material and replaced it with good borrow to furnish a satisfactory base. El Toro. -- El Toro was constructed about 7 miles southeast of Santa Ana in Orange county, Calif. The land, which had been used for agricultural purposes, was sandy, having been formed by sedimentary deposit from eroded hills to the east. In general, all buildings had concrete foundations, concrete floors, and superstructure of redwood siding nailed directly to the wood framing. Three runways were paved with asphalt concrete on a compacted base course. Two were of concrete. Taxiways connected the ends of each runway. The job progressed well, with no great difficulties causing delay in completion. The greatest delay was caused when fire destroyed a nearly completed cold-storage building. Late war construction gave El Toro facilities which in some ways exceeded those at Cherry Point. There were 17 hangars, compared to two at Cherry Point. The assembly and repair facilities covered 1,100,000 square feet, compared to 564,000 square feet at Cherry Point. Cherry Point on the other hand had personnel facilities for 28,000 compared to 16,500 at El Toro; gasoline storage for 3,100,000 gallons, compared to 1,375,000 at El Toro; and eight runways, compared to five at El Toro.